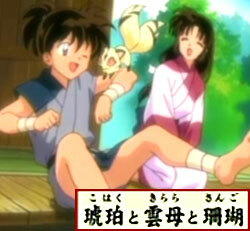 KAG: Sango's little brother Kohaku had fallen into Naraku's cruel trap. He's been under control ever since. Even now, Kohaku is still being manipulated by Naraku. Sango continues to feel responsible for him, and even though we would like to help her, it's not easy. I wonder what Kirara thinks of Kohaku?